d) that each teacher, at every career stage should be nurtured, known, challenged, supported and developed in a continual process, not judged through snap-shots and one-off performances or datasets. e) that evidence of learning is complex and needs to gathered and evaluated with a broad view of what constitutes success and a high bar for making assumptions about causal links between specific inputs and specific outcomes. f) that there are bottom lines below which standards should not fall; that underperformance must be addressed in a robust manner. g) that within a transparent pay structure, with opportunities for career progression, the intrinsic motivation of working in a supportive high-trust high-challenge culture outweighs any motivational effect from outcome targets and performance pay. It would be wrong to suggest that we get this right all of the time; people need time to fully embrace this thinking – in fact it requires a conscious effort to avoid resorting to default-mode top-down enforcement when things don’t run smoothly. However, hopefully, we’re on the right road. 1. A Shared Vision for Teaching and Learning. We’re using all of our CPD time for the rest of the year to run a process that will lead to a shared vision for learning at Highbury Grove. This includes working with Martin Robinson, author of Trivium 21st C as one source of influence alongside research-informed evidence about learning and our sense of the values we share as a school community. Most importantly, we are seeking input from every department and teacher; we want people to promote and share their own ideas about learning so that everyone feels they’ve contributed. Whatever consensus we reach will be captured in a whole-school document supported by subject-specific variants. We want our agenda for teaching and learning to belong to us; not feel like it is being dictated by an external body. The vision statement could then be used as a reference point for subsequent reviews. A comprehensive ITT programme, supporting NQTs and Teach First. We already have this in place, with individual mentors, regular conferences and dedicated CPD events. A programme of CPD activities designed to meet the needs of all members of staff at their respective career stages: ITT, 3-5 years, Expert Teachers, Aspiring Leaders. A big part of our work this year is to get this all in place for September building on the best of what we already do and trying out a few ideas along the way. 3. Professional Review instead of appraisal based on data targets. We’ve replaced the annual appraisal meetings where teachers are asked to look at outcome targets and compile folders of evidence to show they’ve met them. Fundamentally I don’t believe target-setting works in that way. It never has for me. Instead, our Professional Review process focuses on career goals, CPD activities and areas for professional and personal development. I want these meetings to make people feel that they’ve had an opportunity to plan their professional learning and map out their future progression. Of course student outcomes will be a key focus for discussion about performance and development – but not a simplistic measure of success. We’ve introduced the BlueSky package to support this process and, over time, we’ll expect people to keep good records of their CPD activities, peer observation and research work to inform the review discussion. The thinking is that the most effective unit within which to evaluate practice is a subject department – not a Year Group or Key Stage and not person to person. 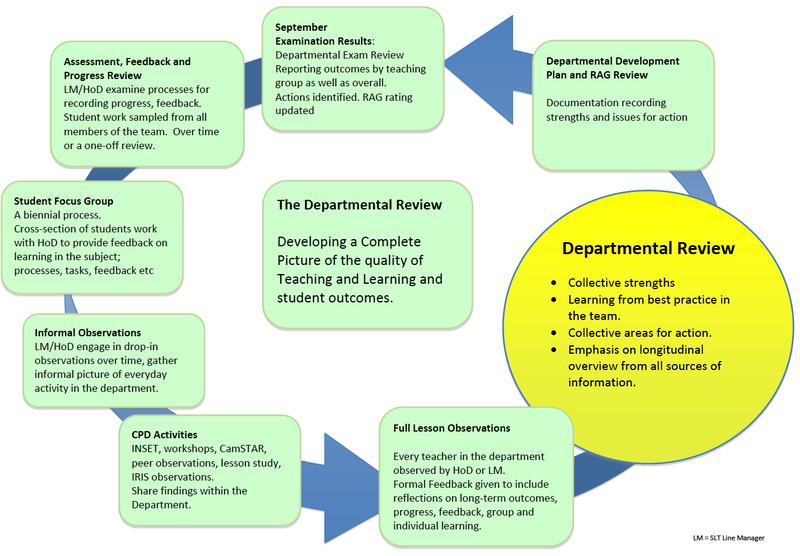 The process described here links individual review to the collective review across a team of colleagues. The evidence spans from October to May; it’s not a snap-shot model. Books, lesson observations, student views and assessment data all contribute to a picture of the quality of teaching and learning; the development points are collective as well as individual. None of the lessons are graded – of course. Grading has always been a ludicrous process and finally we’re breaking out of the whole psychology of judging one-off performances. As I describe in my post Lesson Observations Unchained, the difference this has already made is significant. Our lesson feedback focuses on key strengths and areas for improvement. Any significant concerns can be identified as such; they feed into a separate process. However, for most people, the removal of grades is opening up the conversation. A key aspect of this is consistent line management. The SLT links will stay with their teams, getting to know people at a deeper and deeper level year on year. Teachers should be known – not simply visited from time to time by an assortment of people. 5. A direct, bespoke approach to underperformance. Finally, our system has teeth – but in the right place. The diagram below (again borrowed from KEGS) illustrates the spirit of our performance system. Most people operate above the line. For them, the system is purely developmental at all times. However, where we do have significant concerns, we’ll be addressing them directly and supporting teachers to get back on track. The Individual Action Plan is at the heart of this. This system forces us to address issues in a direct manner. If a teacher has not been told directly that significant concerns exist in time for them to address them, they should assume that none exist and expect full pay progression – that’s our approach. It’s straight out of the joint union response to the PRP consultation; it’s fair and sensible. Of course, the very bottom line is the capability box. It is always there for all of us; no good pretending otherwise. But that doesn’t mean people need to fear it. They’ll be given plenty of time and support if they get anywhere near it. Looking in form the outside now I would have valued this dignified approach to observation. Classroom teachers,the heartbeat of the school, need to feel that observations are about shared successes and working through a very demanding vocation each and every day,every period every minute. Observations without threat will encourage the best out of us all. This is definitely the way forward. We have started to adopt a similar approach where staff teams are responsible for their own self evaluation and self improvement. This has opened up professional dialogue and a real ‘buz’ about developing learning. Faculties have key principles they have agreed and the quality assure them collectively. SLT’s role is to support, challenge and verify their QA. Gone is the Whole School Review, the 1 off lesson observation and thankfully the grading. This has help teacher realign their focus and empower them to experiment and develop freely. The key is ensuring the processes are in place to support middle leaders support their teams, and make sure underperformance is quickly identified and those teachers helped to improve. I love your belief that teachers should be known & not visited by an assortment of people. We’re visited by lots if different Heads from up & down the country, local heads etc etc. this equals constant fear, suspicion and stress. Some teachers are reluctant to help others and won’t work as a team because they’re frightened others will have better lessons. It’s hideous. Your ideas are wonderful and will no doubt have a positive impact. 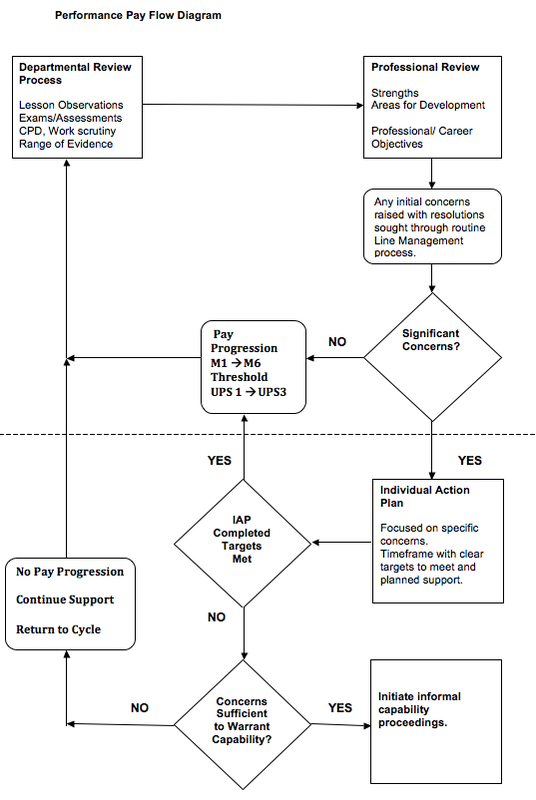 This looks like a comprehensive and consistent approach to accountability. My guess is that it will be effective, as long as external factors don’t force changes. Underpinning this approach is what the school thinks education is for, both in general and in your particular context. As long as that is clear (and it looks like you are currently working on that) then the required focus for success will also be there. Good stuff. Excellent article. We have been looking at how peer observations can be a part of our process. I think we have a similar structure to you in many ways but I will be borrowing your flowchart – great work. What an interesting and supportive culture you have. I have always believed that effective leadership is providing a culture in which your staff’s strengths & skills can come to the fore & this seems to be like the perfect environment to encourage this. Your third point about expecting your staff to maintain effective records of ther CPD & sharing good practice is an important one and I would be very keen to hear what structures & methods you come up with as a school.